The Barkhamsted Reservoir is the primary water supply for the city of Hartford and its surrounding area. The reservoir extends north 8 miles from central Barkhamsted, almost reaching the Massachusetts border. In order to accommodate this massive body of water, the Metropolitan District Commission (MDC), which oversaw the reservoir’s construction, cleared numerous acres of trees and farmland, redirected highways, and transplanted cemeteries. The greatest obstacle to the reservoir’s completion, however, proved to be convincing local residents to abandon their homes in the name of progress. The application for the construction of the Barkhamsted Reservoir reached the state legislature in 1929 and finally received approval in 1933. During this time, the 9-billion-gallon Nepaug Reservoir served the city of Hartford. The plans for the Barkhamsted Reservoir called for a capacity of 30 billion gallons—harvested from the east branch of the Farmington River. The plans also required the installation of 8 miles of large-diameter pipe to connect the reservoirs, the relocation of 20 miles of highway, and the removal of 4 cemeteries and 1,300 interments within those cemeteries. The Saville Dam, completed in 1940 and named after chief engineer Caleb Mills Saville, held the water in place. As for local residents, the MDC began buying up their landholdings to make way for the reservoir as early as 1927. 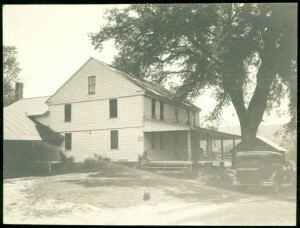 The first farm the MDC purchased belonged to the Stewart family of Hartland Hollow. While properties in Hartland Hollow rapidly fell under MDC control in the following years, residents of nearby Barkhamsted Hollow expressed a little more reluctance to sell—some holding out well into the Great Depression. When the Depression hit, however, it became harder for the last holdouts to remain in their homes. With their neighbors gone, so were their friends, business partners, and customers. Ultimately, by the summer of 1936, the valley lay empty. It was during the summer of 1936 that S.J. Groves, a land-stripping company from Ridgefield, began removing the remaining obstacles to the reservoir’s completion. Local residents in need of work often found themselves employed in tearing up trees and fields in their old neighborhoods. After a bonfire of building materials, trees, branches, and farming equipment turned piles of debris to ash, all that remained of the old residences were empty cellar holes. 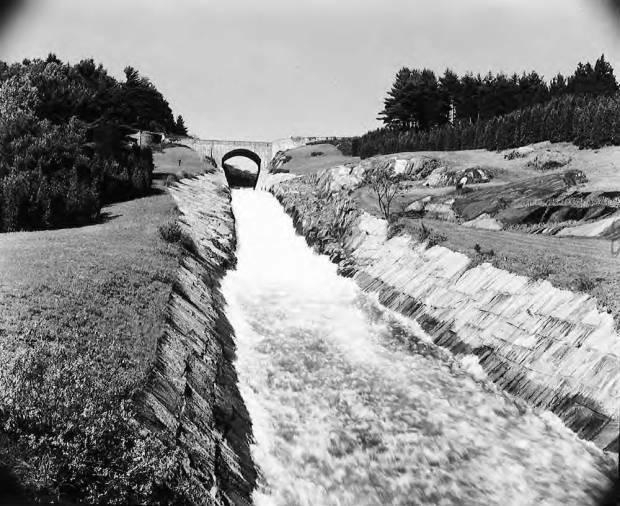 On December 21, 1944, water flowed directly from the Barkhamsted Reservoir to the city of Hartford for the first time. It took another 4 years for the reservoir to fill completely. While the Barkhamsted Reservoir project proved successful, taking much of the strain off the overburdened Nepaug Reservoir, it cost 1,000 displaced residents their homes and livelihoods.